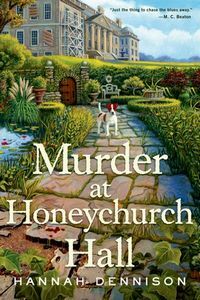 Murder at Honeychurch Hall by Hannah Dennison: Synopsis and Online Purchase Options. Synopsis (from the publisher): Kat Stanford is just days away from starting her dream antique business with her newly widowed mother Iris when she gets a huge shock. Iris has recklessly purchased a dilapidated carriage house at Honeychurch Hall, an isolated country estate located several hundred miles from London. Yet it seems that Iris isn't the only one with surprises at Honeychurch Hall. Behind the crumbling façade, the inhabitants of the stately mansion are a lively group of eccentrics to be sure — both upstairs and downstairs — and they all have more than their fair share of skeletons in the closet. As Iris's past comes back to haunt her, Kat realizes she hardly knows her mother at all. And when the bodies start piling up, it is up to Kat to unravel the tangled truth behind the murders at Honeychurch Hall.